I have a review of another Heather's Hues polishes today which also happens to be my Halloween mani I'm wearing today. This has to be one of the coolest nail polishes I've tried this year and probably one of the top ones I've tried ever. I don't see magic like this too often these days. This was the nail polish I got out of bed to polish a couple of weeks ago. I think you all will agree. 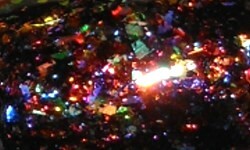 Killer Costume Party is a clear base and is packed with iridescent chameleon glitters, iridescent color-shift flakes, and multichrome flakes in violet/red/orange and red/copper/bronze. Color: Wowza! That is some magical polish! There is some much colorful multichrome and color-shiftness going on. I make less and less sense the more amazing the nail polish. This is a stunner and so unique and magical in my collection. Formula: Excellent easy to apply formula. I used 2 coats over a black creme. I love this layered it really pops! Price: This is $10 for a 15ml bottle or $5.75 for 7.5ml bottle on Heather's Hues etsy page. Overall: Sneak peak! This will be one of my Top 25 of 2016 polishes. This is probably my favorite polish of the year. I love everything about it. How could you not? Everyone needs this one. Get it! Check out other HPB members Halloween manis! Sinful Colors Where Oh Werewolf?